A Chinese Tangzhong starter / Water roux starter is a mixture of flour and water. That is to combine together one portion of bread flour and five portions of water by weight in a pot. Heat up the mixture to bring out the gelatinization of starch in flour. What makes the bread baked with this kind of starter difference is Starch Gelatinization, which helps to engage more water, namely more water will be absorbed, to provide a characteristic softer, more elastic-textured bread. Moreover, the bread will have long-lasting freshness. When I saw Angie’s post it was love a first sight. I had all the ingredients I needed at home and wanted to make the bread immediately. I had a few questions to ask Angie regarding the Tangzong Starter and amount of yeast added but because of time difference Angie was probably sleeping when I sent her the e-mail, so I google searched to find out more about it. I read a few posts here and here. The first time I made this recipe I divided the bread dough and made half of it into some savory buns using halloumi and gouda and I sprinkled some poppy seeds and black sesame seeds on top and in the other half I added tahini with honey and cranberries. Although the dough has sugar in it the combination with the savory filling was fantastic. We loved them and the Tangzhong starter was really easy to make. I had some leftover starter so the second time I tried them using honey, instead of maple syrup. The result was just as good. I preferred not to add any filling and we ate them for breakfast with merenda, which is a chocolate cream similar to nutella, with jam and made some sandwiches. Whisk together the water and the flour until the mixture is well blended and lump free. Stir the mixture while it cooks over the medium heat to reach 65C/150F. It takes about 2-3 minutes. If you don’t own a thermometer like I do, continue whisking until the mixture starts to thicken up and remove immediately from the heat. Transfer to a bowl and cover loosely with plastic wrap to prevent from drying and after completely cooling down you can start using it. Store the remaining starter in the refrigerator, covered with cling film. This starter must be used within three days. On the third day I still had some leftover starter so I made some plain buns (without the egg wash) for some turkey burgers I made. Note: Although the amount of yeast used in the recipe seems a lot, this yeast was bought from my local bakery and the amount of yeast used was satisfactory. However, when I made them again, I bought the yeast from the supermarket. I followed the instructions on the package which was 42 grams yeast for 1 kilo of flour and again the quanity used was satisfactory. So you will have to adjust the amount of yeast accordingly. Place all the dough ingredients, except butter, in a mixing bowl. Mix with dough hook at slow speed for 1 minute. Switch to medium speed, and continue to knead until a dough forms. Add butter gradually and beat until gluten is fully developed, i. e. elastic and smooth. Place the dough in a lightly greased bowl, covered and leave in a warm place for about 1 hour until the dough has doubled in size. Divide the dough into 2 even portions, round up and rest for about 10 minutes. Press down each dough to release gas and divide into 6 equal parts. Roll out each piece of dough as thin as you can and add a tablespoon of halloumi and gouda (or tahini and cranberries) and roll up. Place each rolled dough in a lightly greased pan or loaf pan or lined with parchment paper and cover loosely with a towel. Leave to rise for about 40 minutes. After rising, brush the dough with egg wash, sprinkle with sesame or poppy seeds and bake in a preheated 175C/350F oven for about 30 minutes. I am sending this recipe to Rachel, of Tangerine’s Kitchen, who is hosting this month’s Bread Baking Day, created by Zorra. Wow….looks awesome. The burger bun looks perfect. Well done! I always find interesting and new stuff on your blog Ivy! I love playing around with different doughs…this looks amazing! Thank you for sharing! That is an interesting method! Your buns look gorgeous! The 'burger' pic looks yummy. It's lunch time and I am hungry! 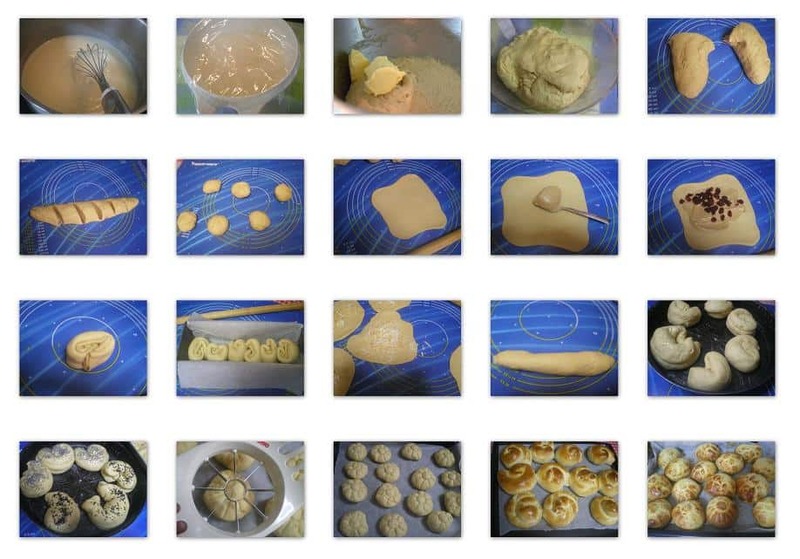 Wow, all the bread buns are beautiful and each done in a different method. Thank you so much for sending this in for the event. Yesterday I just made a bread using the same kind of a starter from another blog. This looks so so good. I am sure bookmarking this one too. Those buns look perfect!Great job! Everything looks delicious, but I really love the buns in the first and second pictures! And the hamburger bun looks picture-perfect–a hundred times better than those you might eat out. I will definitely be trying this soon. Ivy! Send me some of these rolls! Once again, by reading your post I learned something new. I had never seen this style of bread-making. Everything on the photos looks great. Ivy, tes pains sont magnifiques et que de variétés. Wow, all those buns look amazing! your buns look so good,ivy,and the turkey burger,too! So interesting about the starter. I want to read more about this! Your bread looks delicious too. I had read about this on Arlette's blog, then Angie's, now yours! Looks like i am gonna have to try it too! join the fun so to speak! Ivy this looks fantastic!! Amazing job! Και μια ερώτηση… όταν λες bread flour εννοείς σκληρό αλέυρι? Magda, the flour I get here in Greece is a yellow package of Allatini and on it it says "για χωριάτικο ψωμί" but yes I think it is "σκληρό". Πολύ ενδιαφέρον Ήβη! Είμαι περίεργη πως θα λειτουργήσει σε συνταγή για τσουρέκι. Wow, I've never heard of that kind of starter and now I'm just jonesing to give it a try! Your hamburger buns look absolutely superior and perfect, but all of those buns look light, fluffy and tender. Just another reason that I could never last on a no-carb diet. I remember you talking about this on Facebook. And also I saw Arlete's post on this; looks so interesting the buns Ivy! What gorgeous looking buns! Great job Ivy. How interesting! I would love to try this some time as a sweet bun. Your Thangzhong buns look brilliant. I can recommend to fill them with Nutella. Very yummy. Thank you for your participation in BBD. 2. After a day, the bread becomes hardened. Do you have these problems when using the Tang Zhong method? Hi Li Lian. I think the bread is supposed to be hard outside and soft inside but regarding the second day that will depend on a lot of factors. If the climate is hot and dry, it will surely become very hard. In this case you will have to store it in the refrigerator or wrap it with something to keep it soft or store it in an airtight bread container. You are welcome Li Lian. Yesterday I discovered that “gelatinized starch” is the secret to achieve the high rising, super soft Chinese bread rolls I’ve tried to replicate for 3 years. Thank you for sharing your bun recipe! I tried it this morning and t’s wonderful.